A few days ago, I spotted a box of plums for $5 at the grocery store. They were dusty, bruised and a little unripe. I took them home. Once home, I put them on the counter. I thought, well, here it is. Proof that you have trouble letting go. 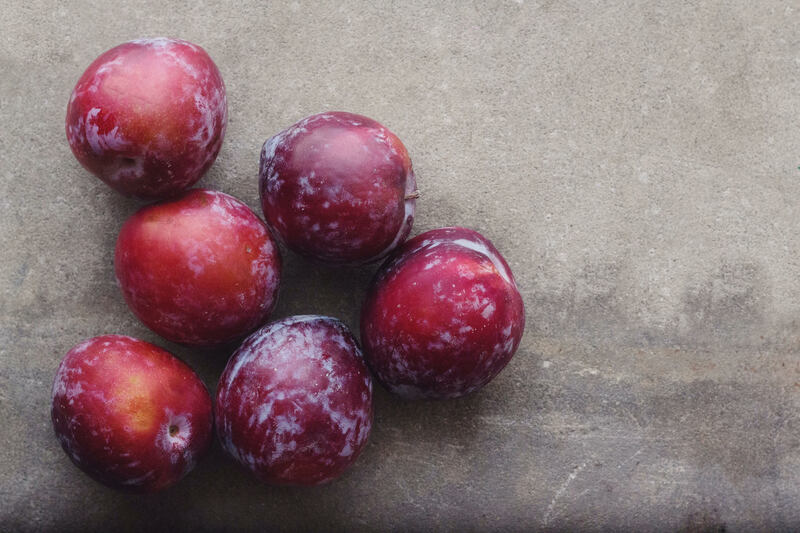 Because really, plums are a thing of the past. Gone. Summer came and it was glorious, and now it is over, away. Along with the plums. But is holding on really the worst thing? If it means I can have plums this late in the season, and plum cake, too, then I am not sure it is. Because this upside down cake is all I want in a fruit cake: easy, delicious and full of plum flavor, not to mention effortlessly beautiful. It is so simple, and so genius: a mixture of butter, maple syrup and sugar is boiled together and poured into a pan, on top of which concentric circles of plum are arranged. The plums and syrup are then covered with the simplest butter cake, and once baked, it’s all quickly flipped over, revealing a gooey, sticky top. It has all the flavor of caramel, but without the effort. It’s pretty but simple enough to serve at a low key event, and best of all, it’s versatile, for all seasons: I’m making one with apples and spices next, and I can’t wait to try it with rhubarb in the spring. This cake makes me think that letting go is overrated. And that cake, of any type, is distinctly not. Why I love this recipe: with notes of maple and brown sugar, the buttery, sticky plum topping flavors the light, crumbly cake below. The caramel top seeps into the cake, making it moist and sweet, and the whole thing takes less than an hour to assemble and bake. Notes: since the plum topping is simple, be sure to use good ingredients. That means good quality butter and maple syrup, too; I love Grade B syrup for its smoky quality and deep flavor. Variation: use all maple syrup in place of the brown sugar or vice versa. Substitute chopped rhubarb, apples, pears or peaches for the plums and add a few dashes of spice (and perhaps a tablespoon of cognac for the apples or bourbon for the peaches) to the batter. In a skillet on a burner over low heat, melt the butter. Once the butter has melted, add the brown sugar and stir it gently. Bring to a boil. 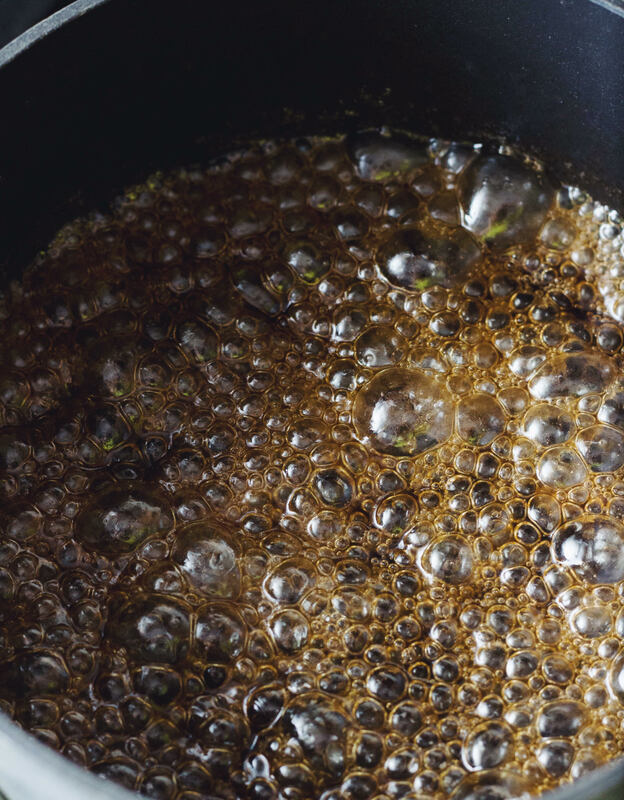 When the mixture is boiling, stir in the maple syrup. Turn off the heat, but leave the pan on the stove. In ta stand mixer, cream the butter and sugar until fluffy. Meanwhile, measure the flour, baking powder and salt in a bowl and whisk gently to combine. Add the eggs one at a time, beating well in between, and scraping down the sides of the bowl, followed by the vanilla. Add the flour mixture and the oil and beat on low speed until just combined, about one minute. Carefully pour the maple and butter mixture into the bottom of an un-greased 9″ cake pan. Arrange the plums in circles over the maple mixture, pressing them closely together. Dollop the cake batter on top of the fruit. Smooth the top with a wet spatula if lumpy. Bake cake for 35-40 minutes, or until the cake is golden brown on the top and a thin toothpick inserted in the center comes out clean. Remove the cake from the oven and place it on a cooling rack. Let the cake settle for 1 minute, until any fruit that has leaked up the sides has stopped bubbling. Do not let the cake cool or you will not get it out of the pan! Run a knife around the edges of the cake. Place a plate over the cake and, using hot pads, carefully flip the cake over. Gently remove the cake pan. Be careful, as the fruit and glaze is still quite hot and will burn! If any pieces of fruit are stuck to the cake pan, gently scrape them up with a knife and replace them on the cake. Let the cake cool. Serve the cake at room temperature, with sweetened whipped cream if desired. The cake keeps, covered, on the counter top for 2 days. 08 Oct	This entry was published on October 8, 2015 at 7:03 pm. It’s filed under Delectables and tagged autumn, baking, blog, butter, cake, dairy, delicious, fall, food, october, photography, plums, recipes, seasonal, summer, writing. Bookmark the permalink. Follow any comments here with the RSS feed for this post. Once again, just stunning. You are a perfectionist Chaya! Hold on to every last bit of summer! Thank you! I love maple syrup and couldn’t resist using it. It adds such a warming note! A chic looking cake. Your styling is stunning.